Buddha Jumps Over the Wall, or fo tiao qiang, is a variety of shark fin soup in Cantonese and Fujian cuisine. Since its creation during the Qing Dynasty (1644 – 1912), the dish has been regarded as a Chinese delicacy known for its rich taste, usage of various high-quality ingredients and special manner of cooking. Left: Buddha Jumps Over the Wall. The dish's name is an allusion to the dish's ability to entice the vegetarian monks from their temples to partake in the meat-based dish. It is high in protein and calcium. The soup or stew consists of many ingredients of non-vegetarian origin and requires one to two full days to prepare. 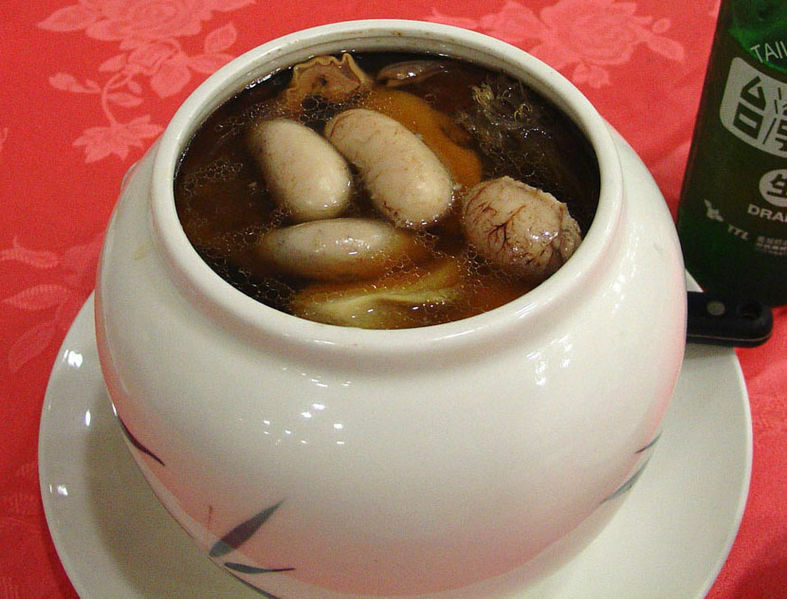 A typical recipe requires many ingredients including quail eggs, bamboo shoots, scallops, sea cucumber, abalone, shark fin, chicken, Jinhua ham, pork tendon, ginseng, mushrooms, and taro. Some recipes require up to thirty main ingredients and twelve condiments. Use of shark fin, which is sometimes harvested by shark finning, and abalone, which is implicated in destructive fishing practices are controversial for both environmental and ethical reasons. There are many stories on the origin of the dish. Among them, a common story is about a scholar traveling by foot during the Qing Dynasty. While he traveled with his friends, the scholar preserved all his food for the journey in a clay jar used for holding wine. Whenever he had a meal, he warmed up the jar with the ingredients over an open fire. Once they arrived in Fuzhou, the capital of Fujian Province, the scholar started cooking the dish. The smells spread over to a nearby Buddhist monastery where monks were meditating. Although monks are not allowed to eat meat, one of the monks who was tempted by the smell jumped over the wall to where the scholar gathered for cooking. A poet among the travelers said that even Buddha would jump the wall to eat the delicious dish. Kai Mayfair in London was dubbed "home of the world's most expensive soup" when it unveiled its £108 version of Buddha Jumps Over the Wall in 2005. The dish includes shark's fin, Japanese flower mushroom, sea cucumber, dried scallops, chicken, Hunan ham, pork, and ginseng.